The public has chosen Tate Modern over the British Museum for the first time since records began. 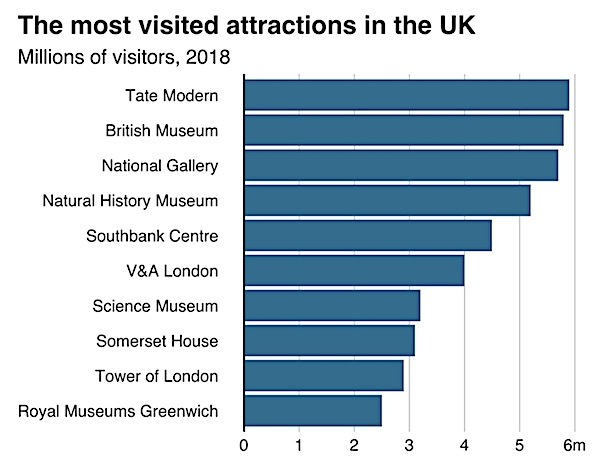 The UK’s most popular visitor attractions’ list published yesterday has shown for the first time in a decade Tate Modern is the clear winner. 5.9 million people visited Tate Modern while last year figures show 5.8 million walked through the door of the British Museum. The Association of Leading Visitor Attractions (Alva) who monitor the figures stated that the hottest Summer on record pushed the attendance levels at Tate Modern to outperform even the British Museum. Blockbuster exhibitions such as Picasso and Modigliani also proved a factor in the popularity of the museum. While the opening of the new Switch House wing with its free observation deck providing one of the best viewing platforms in the city has proven a winner. The new Switch House building designed by architects Herzog & de Meuron also developed the original conversion of the Bankside Power Station in 2000. It is the most important new cultural building to open in Britain since the British Library. The world’s most popular gallery of modern and contemporary art is now even more international, diverse and engaging. Tate’s collection of modern art has been completely transformed since Tate Modern first opened in 2000. As a result of a focused and intensive international acquisition programme over recent years, the collection is now far more diverse, including more photography, performance and film, as well as more work by women artists. The completely re-hung free collection displays feature 800 works by over 300 artists from over 50 countries from Chile to India, Russia and Sudan to Thailand. The new Switch House wing displays tell a broader story of modern and contemporary art over the last 100 years. Seventy-five percent of the art on show has been acquired since Tate Modern first opened and half of the solo displays are dedicated to women artists. The works are displayed across the existing Boiler House and the newly built Switch House. The Switch House increases the size of Tate Modern by 60% and offers a huge new variety of experiences for visitors. They range from the subterranean concrete Tanks, the first permanent museum spaces dedicated to live art, to new spaces for Learning and the magnificent panoramic public viewing terrace on Level 10, offering an entirely new perspective on London. The Turbine Hall now becomes the central space of the museum. Much-loved masterpieces by Pablo Picasso, Mark Rothko and Henri Matisse, are joined by recent acquisitions from around the world which open out the history of modernism. These include 1930s photography by Lionel Wendt from Sri Lanka, 1950s college by Benode Behari Mukherjee from India, and 1960s sculpture by Saloua Raouda Choucair from Lebanon. There are also significant works of contemporary art, including a giant tower of 800 radios by Cildo Meireles from Brazil, a room full of human hair and car bumpers by Sheela Gowda from India, a tapestry of thousands of bottle tops by El Anatsui from Ghana and an immersive 8-screen film installation by Apichatpong Weerasethakul from Thailand.